Moon Hoax: Collection Highlights (Kennedy fonds) | What's that, UASC? Our archive largely collects the papers and materials of the University of Saskatchewan’s researchers and professors and because of this we come to possess materials on topics that may surprise you. 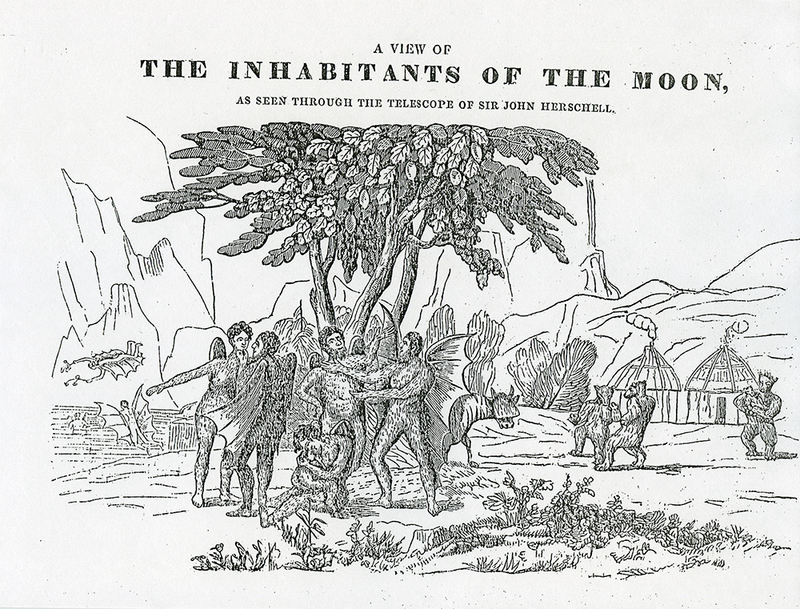 One such fascinating example is John Edward Kennedy’s papers on the Great Moon Hoax of 1835. This collection of papers includes research materials and photocopied and typed copies of the original articles. In August 1835, a New York newspaper called The Sun ran a series of six articles describing in detail the new and groundbreaking observations of the moon, made astronomer Sir John Hershel. The first article which was published on August 25th described the new and powerful telescope that Herschel had created, “24 feet in diameter”.1 Tantalizing mentions of what Herschel then saw with the use of his telescope were hinted at, but not revealed to readers in this first installment. The second article, printed on the 26th, begins to describe the wonderful discoveries Hershel has made – plant and animal life! They describe dark red flowers, trees, a lake, and other stunning geographic features. They then spot “herds of brown quadrupeds, having all the external characteristics of the bison, but more diminutive”.2 They also describe seeing a blue goat-like creature, with a single horn, as well as varieties of birds and fish. August 28th is the pièce de ré·sis·tance of this set of astronomical discoveries, in which they describe human-like creatures who “averaged four feet in height, were covered, except on the face, with short and glossy copper-colored hair, and had wings composed of a thin membrane, without hair, lying snugly upon their backs, from the top of their shoulders to the calves of their legs.”4 They name this species Vespertilio-Homo. The fact that it is referred to as a hoax suggested that people fell for it – and by many accounts they did. Edgar Allen Poe is quoted as having said “not one person in ten discredited it”.8 It was reprinted in newspapers across the country, and thus the hoax was spread and believed to varying extents, across the country. It was the War of the Worlds of it day – though with less panic. 2 The Sun: Aug 26th, 1835., ibid. 3 The Sun: Aug 27th, 1835., ibid. 4 The Sun: Aug 28th, 1835., ibid. 5 The Sun: Aug 29th, 1835., ibid. 7 The Sun: Aug 30th, 1835., ibid. 8 Boese, Alex. “The Great Moon Hoax“. Hoax Museum. c. 2015. Also check out the Missed in History podcasts on the topic if you are interesting in hearing more about the moon hoax. This entry was posted in Archival Holdings on August 25, 2016 by aec059.